Over the last four years, Save the Sound has made significant progress on a multistage project to restore habitat and improve water quality at Sunken Meadow State Park in Smithtown, NY on Long Island. Our efforts got a big boost this month with the planting of native grasses. Contractors used heavy equipment to lower the elevation of the marsh this past spring. In 2012, Superstorm Sandy blew out a berm that had restricted tidal flow in Sunken Meadow Creek for decades, restoring a natural tidal flow to the creek. 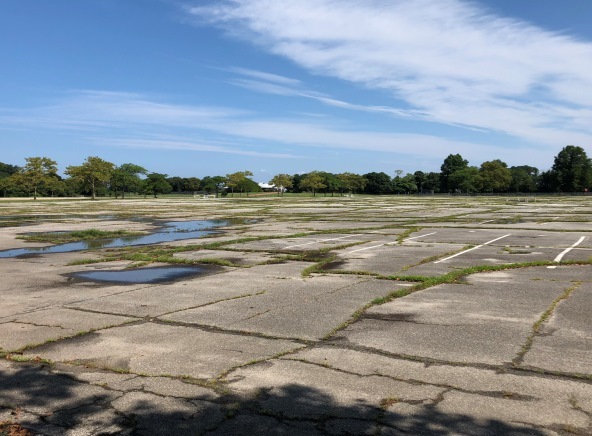 Save the Sound was awarded funding through the National Fish and Wildlife Foundation’s (NFWF) Hurricane Sandy Coastal Resilience Competitive Grant Program to strengthen Sunken Meadow State Park’s resiliency. Since the start of the project in November 2014, Save the Sound has worked with our partners at New York State Office of Parks, Recreation, and Historic Preservation (OPRHP) and New York State Department of Environmental Conservation (NYSDEC) to make significant progress in completing each of these components. In 2015 and 2016, over 100 volunteers joined us in planting native marsh vegetation in an area with restored tidal flow. Save the Sound and SumCo staff measure water levels and examine the marsh mid-restoration. 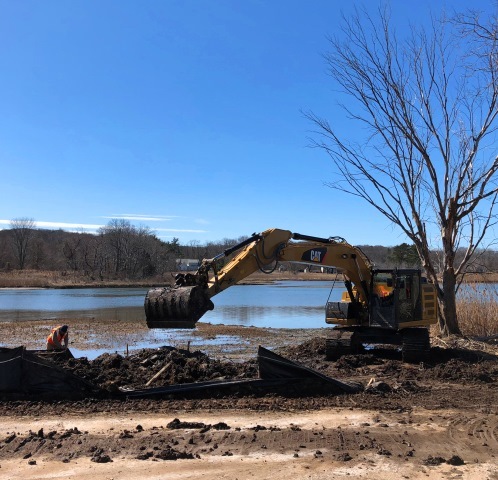 Construction of 2 acres of marsh restoration, designed by Louis Berger, began in March 2018 and continued throughout the summer with the final planting in November 2018. Construction, which has been executed by SumCo, included the mechanical removal of the invasive giant reed Phragmites australis, regrading of the marsh surface, and planting of native marsh grass species such as Spartina alterniflora, Spartina patens, and Distichlis spicata. The invasive Phragmites that dominated the marsh was removed with construction equipment. The contractor then re-graded the marsh surface. By setting the elevation to a level where the surface is inundated with salt water tides twice daily, we are creating conditions that are more favorable to native salt marsh species than invasive freshwater plant species. The north shore of Sunken Meadow Creek before, during, and after invasives removal and re-grading. Inundation by salty water will promote growth of native saltmarsh grasses. 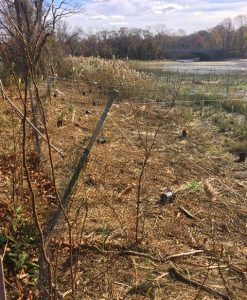 Baby native shrubs planted on the slope above the marsh will provide erosion control and wildlife habitat. 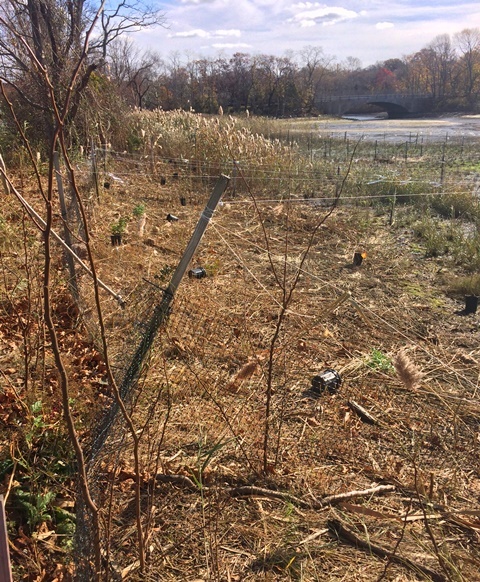 The project included the planting of over 25,000 native low and high marsh grass plugs and surrounded them with fencing and reflective ribbon to deter hungry water fowl. Additionally, hundreds of native shrubs of multiple species were installed along the upland slope of the project site. All were grown from seeds collected at Sunken Meadow State Park by volunteers with the Seeds of Success Program and grown at Pinelands Nursery. Some Phragmites began to re-emerge, so we are continuing to pursue invasive plant control. We’re confident that with the lower elevation and restored tidal flow, the native species will eventually out-compete the Phragmites and restore the entire 2-acre area to a native marsh community. 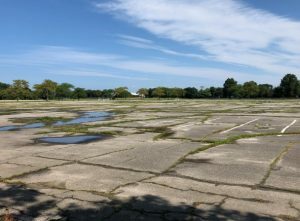 This summer we also completed final design plans for a green infrastructure retrofit of an 18-acre asphalt parking lot which currently contributes high volumes of runoff and pollutants to Sunken Meadow Creek when it rains. By the time we’re done, approximately 8.6 acres of bioretention gardens and constructed wetlands will reduce the annual stormwater discharge to Sunken Meadow Creek by approximately 14.3 million gallons per year. 18 acres of parking lot shunt dirty runoff into the creek when it rains. We’ll build plant-filled depressions to capture and filter that water. In addition to contributions from NFWF, construction of this project is being funded through the New York Governor’s Office which is being managed by OPRHP. OPRHP put out a bid for construction that closed November 9, and anticipates beginning construction in early 2019. You can see bid details here. Also coming in 2019—another volunteer planting! Stay tuned next spring to learn how you can pull on your boots and help continue the restoration of this incredible marsh.